<< The garage was converted to living space in the 1950s. Room to flow and room to grow - that is what this unique home in the Rancho Estates offers, both inside and out. Originally designed by world renowned architect Cliff May and built in 1953, this Rancho features three expanded bedrooms and two bathrooms, a large family room and enormous living room, dining room, back-to-back fireplaces and an open kitchen in 2,532 square feet of interior living space. 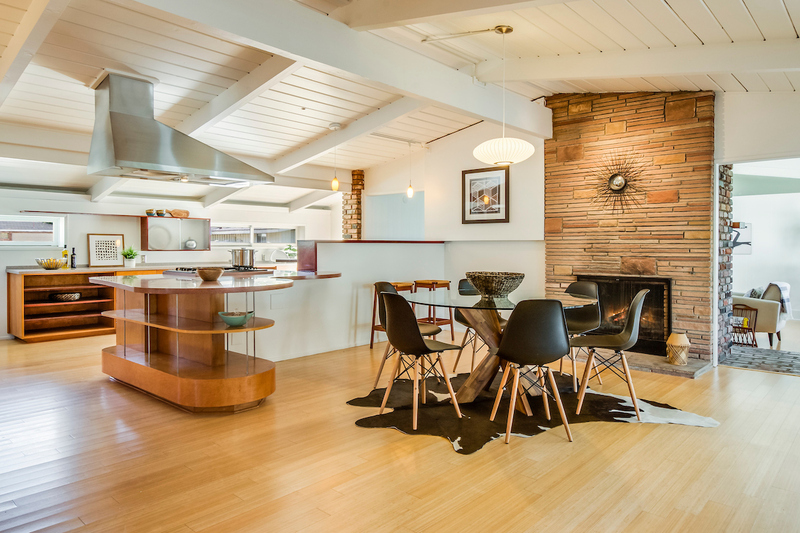 This home is likely the largest single level residence in the Rancho Estates and it exudes midcentury modern character with open beams, tongue and groove wood ceilings, abundant natural light, clean lines, and an open floor plan. Although currently configured with a one car garage, the option exists to accommodate two cars. Extensively refurbished in 2004/2005 by the family of the second owner, it has numerous upgrades including air conditioning, tank-less water heater, a 200 Amp electrical upgrade and bamboo flooring in the dining room and kitchen. The kitchen is exceptionally spacious and features birch veneer cabinets, solid surface countertops and custom range hood atop a stainless range. This is also one of the largest lots in the Rancho Estates at almost 7,000 square feet, which offers two private outdoor areas off the living space, one of which is large enough to accommodate a pool. For the buyer who desires architectural style with space to spread out, in a great neighborhood adjacent to 800 acres of parkland, this property presents a special opportunity. The original owners made several changes to the home during the late 1950s. Most notably, the south facing kitchen wall was pushed out towards the original fence line, and the garage was converted into a great room with added fireplace and brick steps. A garage was created in the carport or driveway area to the west. The home was featured in a multi-page spread of Sunset magazine in the late 1950’s. The second owner purchased the home in 1961. The home was left essentially unchanged until the mid to late 70’s when 10 feet was added to each of the 3 bedrooms on the east side along with a 25 x 25 foot recreation room where the patio used to be. The exterior waterfall that was in the corner of the patio was enclosed at that time. The recreation room features polished tan concrete flooring. About 30 years ago, the metal roof was installed. This roof has a nominal 50-year service life. The recreation room and a portion of the master bedroom have torch down roofing due to the low pitch of the roof.